Checklist investing is a simple process with tremendous benefits. An investment checklist can protect you from yourself, and propel you towards investment success. Atul Gawande is known for writing The Checklist Manifesto – a book where he describes how checklists protect us from our cognitive biases. That’s it – just five steps. Things doctors and nurses already know, and yet Provonost felt the need to create a checklist. Why? It turns out that doctors were routinely skipping steps. Provonost asked nurses to stop doctors if they skipped steps and it helped tremendously. After a year of this system being in place, the ten-day infection rate decreased from eleven percent to zero. The checklist method of preventing infections prevented at least eight deaths and saved two million dollars in costs. It’s easy to take shortcuts, even when you are a highly trained professional. In the hospital situation described above, checklists had a dramatic impact because it helped the doctors and nurses focus on the small things that, when added up over many interactions, had a big effect on overall infection rates. A checklist can help make sure these mundane little things are done every time, all the time. Some investors fall prey to their emotions. They get caught up in the hype of a new tech stock or sell off shares because of fear. It’s commonly known that the S&P 500 outperforms the average investor. That happens because rather than adopt a simple buy-and-hold strategy, investors allow their emotions to get the better of them – causing them to make sub-optimal decisions. Investors can benefit from outsourcing their discipline to a investment checklist in the way pilots do. Pilots use checklists prior to take-off to make sure everything is functioning as it should, and investors can use a checklist to make sure all is in order prior to investment. Checklists are great for reducing human error, but they are also valuable in that they provide a type of documentation. Imagine one follows the checklist prior to investing in stocks and it doesn’t work out. A smart, motivated investor can examine what went wrong and see if another item needs to be added to the investment checklist. For example, maybe you rushed in without making sure the business had a true economic moat. Do your post-mortem and then add that step on the investment checklist. You’ll never make that mistake again. 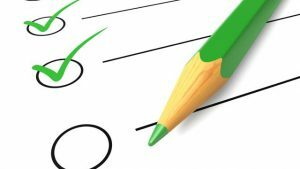 Checklist Investing: What goes on the Investment Checklist? Investors such as Warren Buffet, Charlie Munger, Guy Spier and Mohnish Pabrai all tout the virtues of using investing checklists when evaluating a company. In a 1977 letter to shareholders Warren Buffett outlined his checklist philosophy. If these veteran value investors are doing it, then maybe you should consider it too. Does the company perform better than its industry peers? Does the business have ten straight quarters of increasing earnings? Does Free Cash Flow tracking Earnings per Share? If not, why? Can it be purchased at significant discount to intrinsic value? Once you work through that and are more or less ready to invest you can go through your final “pre-flight” checks. These are all examples of items that can make their way onto an investor’s checklist. Your checklist is going to be different from someone else’s – it’s a highly individualized and personal tool. Your checklist may ask you to input your exit price ahead of time, while another investor completely eschews that step. We’ve heard this phrase before. A checklist is only as good as the items on it. Good checklists are precise and efficient, while bad checklists are vague, too long and confusing to use. Don’t try to spell out each step – just use the checklist to provide reminders of the most critical and important steps. A checklist is also not a replacement for human judgement and careful analysis. It is a tool to help during the investing process, and can aid in refining your investing methods the more you use it. Checklists are great in the sense that they act as a check on our individual lapses in judgement. One needs to be intelligent, and a good analyst to be a successful investor, that is certain, but doing the small things right, day in and day out, will give you an edge in the market far surer than swallowing an advanced quantitative methods textbook will. Do yourself a favor, use an investment checklist. Jiva Kalan is a writer whose work has been featured on DailyFinance, the Wall Street Survivor, Plousio and Financial Choice.